Keyboard shortcut activates screensaver and locks session. Is there a better alternative to Salute? Is Salute really the best app in System category? Will Salute work good on macOS 10.13.4? With Salute you can quickly get access to common tasks in macOS with a quick keyboard shortcut. 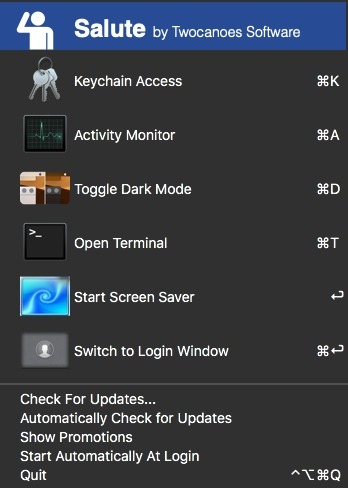 Press Control-Command-Delete, and you have quick access to locking the screen, switching to the Login Window, Activity Monitor, Terminal, and switching to Dark Mode. Stop wasting precious time reaching for the mouse or searching with spotlight for these common operations. Salute needs a rating. Be the first to rate this app and get the discussion started!